The philosophy of education at Trinity Catholic School is to develop the whole child; spiritually, academically, physically and emotionally. Students study across the seven Key Learning Areas of Religious Education, English, Maths, Science and Technology, Human Society and Its Environment, Creative Arts and PD/Health/PE. All ranges of abilities are catered for with provision for students needing individual help because of learning difficulties and for those requiring gifted and talented enrichment. The philosophy of education at Trinity Catholic School is to develop the whole child; spiritually, academically, physically and emotionally. Information Communication Technology is integrated into all aspects of the curriculum and our students graduate from Trinity computer literate. Students study a broad range of subjects across the seven Key Learning Areas of Religious Education, English, Maths, Science and Technology, Human Society and Its Environment, Creative Arts, PD/Health/PE. All courses follow the syllabus documents developed by the New South Wales Board of Studies and the Religious Education Document Treasures New and Old. These documents explain the outcomes to be achieved, the content to be taught and provide assessment guidelines. Various extra curricular activities are offered to enrich the Curriculum such as individual music lessons, opportunities to participate in a variety of sports and prgrams that enhance learning such as Public speaking, Book Club, Mighty Maths and Lustrous Literacy. Extracurricular activities provide a channel for reinforcing lessons learned in the classroom. They offer students the opportunity to apply academic, social and spiritual skills in a real-world context, contributing to a well-rounded education. These activities offer opportunities for students to learn the values of teamwork, individual and group responsibility, physical strength and endurance, competition, diversity, and a sense of culture and community. Sporting Competitions: Trent Barrett Shield, Mortimer Shield, Young Soccer Carnival, Canberra Soccer Carnival, Riverina Netball Cup and NSW Combined Catholic Schools Basketball Championships. 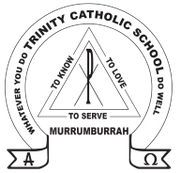 A key feature of Trinity Catholic School’s success is the active involvement of students in the life of the school. The school offers a diverse range of leadership opportunities for all students. These include joining leadership teams and participating in leadership programs such as: School Prime Ministers, Parliament Ministerial Positions (Year 6), House Captains, Sporting Team Captains, Bunyip Reading Program, Buddy Bears Program and Peer Support. School Parliament provides an opportunity for students to participate in the running of their primary school and is a vehicle for them to express their opinions and participate actively in decision making. Once a month our Year 6 leaders present a Parliament Session to the school and community reporting on activities within the school and community related to their ministerial position E.g. Religious, Environment, Technology or Sport.